Asynchronous Serial Interface is a streaming data format which often carries an MPEG Transport Stream (MPEG-TS). It is typically physically carried on 75-ohm coaxial cable, terminated with BNC male connectors on each end, though the ASI data can be transported by wireless or fiber links. 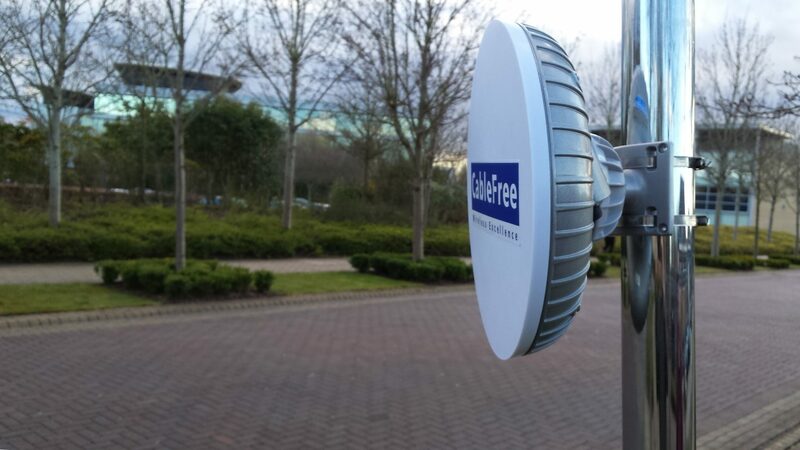 CableFree AMR Microwave Radio is a link specifically intended for transport of multiple ASI signals over microwave point to point wireless connections. An ASI signal can carry one or multiple SD, HD or audio programs that are already compressed, as opposed to an uncompressed SD-SDI (270 Mbit/s) or HD-SDI (1.485 Gbit/s). An ASI signal can be at varying transmission speeds and is completely dependent on the user’s engineering requirements. For example, an ATSC (US digital standard for broadcasting) has a maximum bandwidth of 19.392658 Mbit/s. Generally, the signal is the final product of video compression, either MPEG2 or MPEG4, ready for transmission to a transmitter or microwave system or other device. Sometimes it is also converted to fiber, RF or SMPTE310 for other types of transmission. There are two transmission formats commonly used by the ASI interface: the 188 byte format and the 204 byte format. The 188 byte format is the more common ASI transport stream. When optional Reed–Solomon error correction data are included, the packet can stretch an extra 16 bytes to 204 bytes total.